Currently in pre-construction at the southwest corner of Danforth Avenue and Greenwood Avenue is a new mid-rise condo development known as Platform Condos by Sierra Building Group. This new development will consist of a proposed 9 storey mid-rise tower with 112 residential units with unit sizes averaging at 740 square feet. The average price for this building will be approximately $400,000 and this project will be launching approximately around Mid September 2017. So register here to have first access. 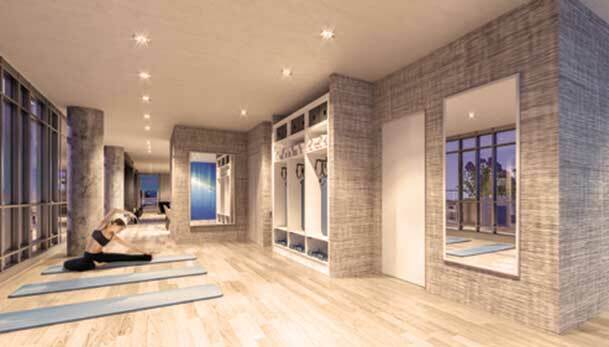 This magnificentboutique condominium project will have an the right height at the right location. It is located in a high demand neighbourhood "Greektown On The Danforth" and with prices averaging around $400,000, this building is not to be beat. The development project area is located in the Danforth neighbourhood of Toronto. There was very little development seen in this community due to the "lack of suitable development sites". 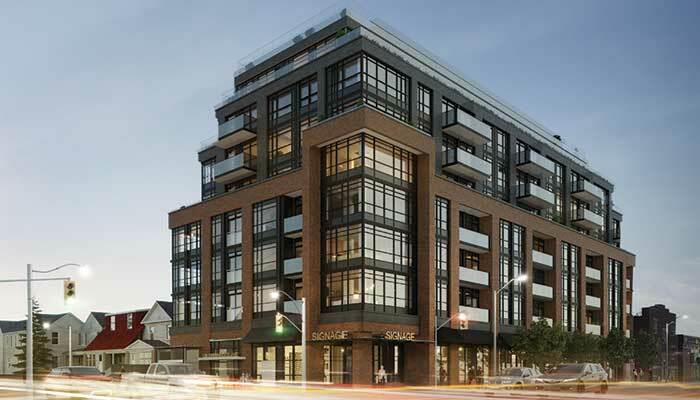 However, the company has teamed up with architects, planners and designers to bring us this mid-rise 9 storey residential tower located on 1177 Danforth Avenue by Greenwood Avenue in Toronto, Ontario. 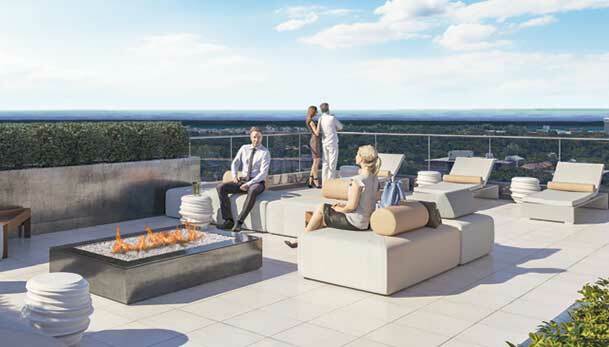 Platform Condos will be competitively priced in a much desired neighbourhood of Toronto. Located between two subway lines (Greenwood Station & Donlands Station) just west of Greenwood Avenue. This project by Sierra Building Group will attract investors and buyers alike with its desirable location in the Danforth Village neighbourhood of Toronto. Register with us today for more information on Prices & Floor Plans. Boutique building with 8 residential floors. 6. 2 levels of underground parking. purposes, or as indicated per floor plans. 9. Smooth ceilings throughout painted in white. 11. Solid core suite entry door. 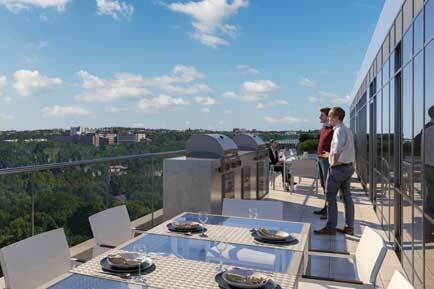 For more information, please register today for the Platinum Access Preview Event for the Platform Condos. The Sierra Building Group is a real estate development company that believes in excellence and has been in business for over 25 years. "The company enlists topnotch trades who use the finest materials to craft homes that appeal to today's discerning purchasers." The developer designs homes that blends into the natural landscape and have developed residential communities in Ontario, Canada and in the United States such as Texas and Colorado Springs. "Wherever the community, the group focuses on providing a superior home and home-buying experience. Adding to that is the group's commitment to unparalleled service, and you can trust this award-wining builder to build your home and sculpt your vision for a bright future." "They provides a solid foundation of excellence. Excellence rooted in over 25 years of creating distinctive new homes, innovative condominiums, and one-of-a-kind communities. Meticulous attention to detail is a hallmark of this real estate company – one of the exacting standards that set this builder's timeless designs and inviting neighbourhoods apart." 68 Main Street - A luxury condominium development located in Markham, Ontario that has been completed and is selling with 6 storeys and 143 units. 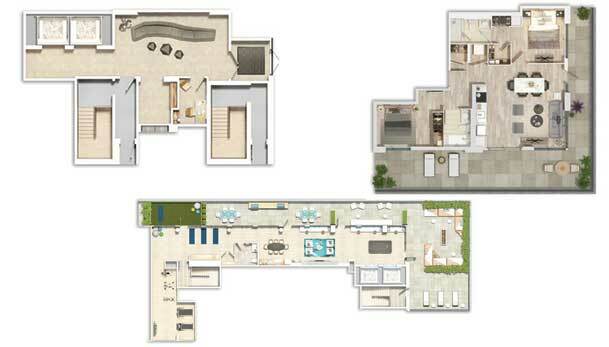 Unit size range from 488 square feet to 1,345 square feet and priced from $237,900 to over $1,000,000. Woodbridge Park - A collection of freehold townhomes currently in pre-construction located at Steeles and Kipling in Toronto, Ontario. Sales will start in Summer of 2015. 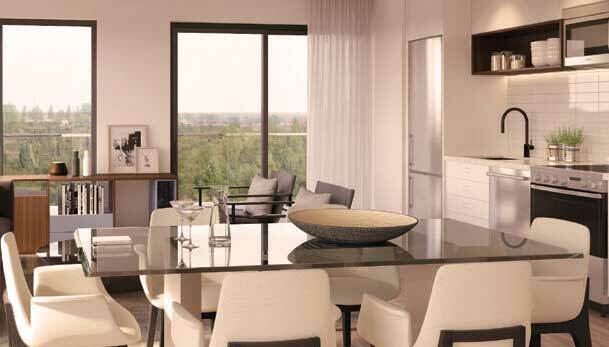 Bur Oak Town Villas - A collection of homes located in Markham, Ontario that has been completed. 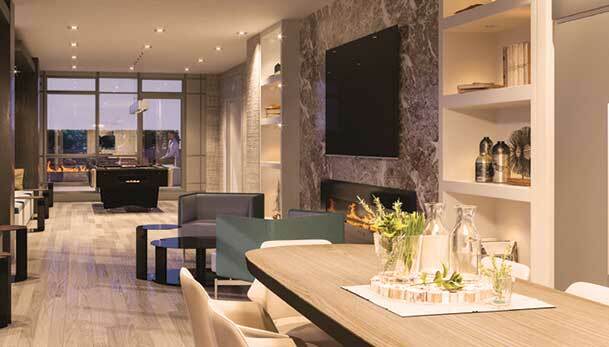 The Exclusive - Exclusive townhomes by the Danforth in Toronto, Ontario that has been completed. Kirshenblatt Korman Architects now operating as award-winning architectural firm Kirkor Architects and Planners was founded by partners Steven Kirshenblatt and Clifford Korman in 1980. They have a mix of about 60 architects, interns and technologists. They have both local and international clients that they work with in creating sustainable developments. Kirkor Architect + Planners are experts in "urban design principles of intensification, mixed-use development and public transportation that are necessary to ensure holistic, healthy building practices". 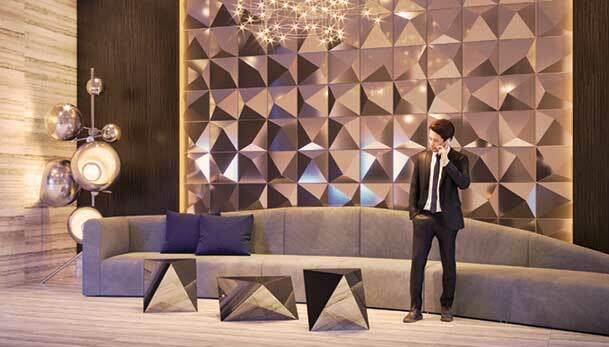 The right kind of people to design the right kind of condo in the right location. Sierra Building Group and Kirkor Architects + Planners will all collaborate to design and to develop Platform Condos coming soon to the Danforth! Register today for more information on this condo project! 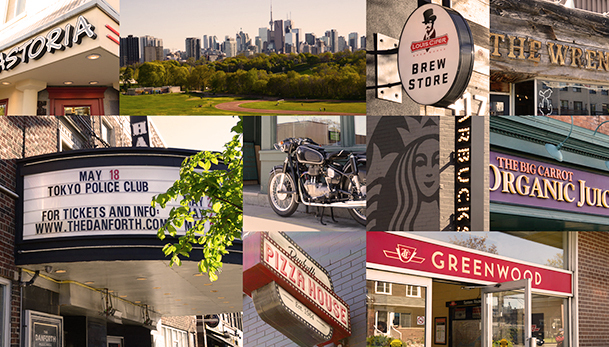 The Danforth is a very vibrant, culturally diverse and desirable neighbourhood in Toronto. It is known for its many shops and restaurants along Danforth Avenue. This community is also known as Greektown with the large annual food festival called, "Taste of the Danforth" that brings hundreds of thousands of people every year to this nieghbourhood. This luxury boutique tower is located to accessible pubic transportation with Greenwood Station located to the east and Donlands Station located to the west. 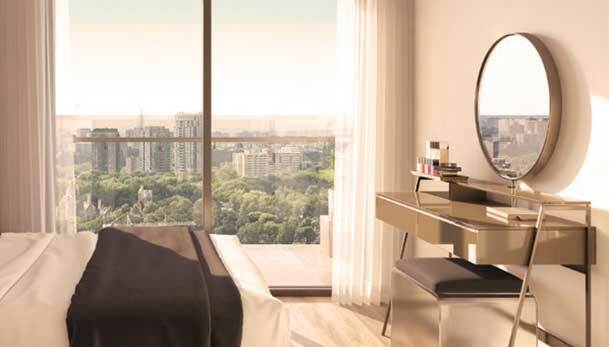 The Don Valley Parkway is situated just to the west of the development site which gives you access to Highway 401 and the Gardiner Expressway. You can find everything you need here: an abundance of restaurants, shops, schools, parks, office buildings and more. A vibrant community in a sought after neighbourhood. 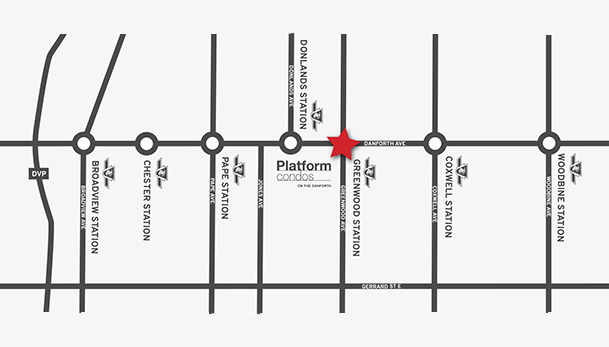 This is where you'll find the Platform Condos. 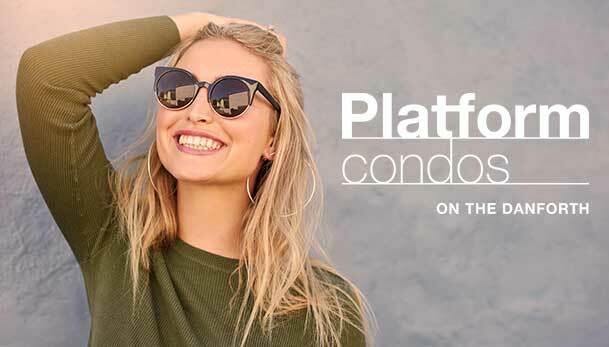 Platform Condos Now Selling. When You Live Here, You Live Connected. Register today for more information on this project!